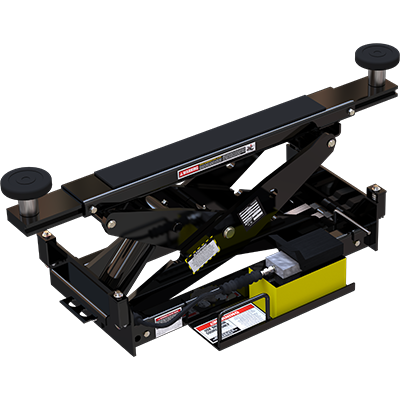 An individual jack is over-engineered and capable of holding the weight of an entire vehicle, so the two jacks you use to lift your car are incredibly safe and may even have an overall lift capacity that’s over twice the weight of the vehicle itself. We do this so there’s never any question as to whether or not our four-post jacking beams are safe. However, it is still important that you never overload a single jack unit past its listed lift capacity. Durable rubber contact pads come standard with every jacking beam. These pads adjust to engage the frame of your vehicle directly at the manufacturer-recommended lift point. Frame cradle pads, sold separately, are a necessary accessory for many wide-bodied frames (e.g., trucks, SUVs). Some undercarriages require longer-reach adapters, so we manufacture stackable adapters to maximize the arm reach on our four-post rolling bridge jacks. They accommodate virtually every vehicle on the market, so it’s just a matter of knowing the weight of your vehicle and selecting a jack(s) with an appropriate lift capacity. Welded to the side of each four-post rolling bridge jack, you’ll find a high-pressure commercial-grade air-hydraulic pump that requires 125 psi and 10-20 CFM. It’s activated when you press a convenient foot pedal attached to the unit. In seconds flat your vehicle will be lifted to the desired height. Each four-post jacking beam can be raised to three different heights, so whatever your needs are, you can fine-tune the height of your jack to meet them. The locks engage automatically as the jack scissor arms raise, and they release simultaneously when as the arms are lowered.